Here's another interesting car (once) owned by a Just A Car Geek reader, Richard Burgess. "I purchased my 1981 280ZX Turbo when I first arrived in the States from the UK in 2005. At the time, I really didn't like Japanese cars, I was holding out for a nice Jag (or maybe a late 90's V8 Mustang, what was I thinking!) but found nothing that did not need a lot of work. Anyway, this car was sitting on a new car dealer lot, due to go to auction as it was too old to sell along with there other motors. I couldn't afford any of there other cars, so they suggested this and threw me the keys. My first drive I was amazed, the power from the straight 6cyl turbo was unbelievable for a car nearly as old as me! I gave them the cash and drove off, although I still wasn't 100% sure I made the right purchase. The issue was the styling, I just didn't think it was a good looking car, after all, the 280zx is usually seen as the ugly Z car. However, as the months went buy, it never let me down, it handled very well and every time, without fail, someone would want stop me and want to talk about it. It was a real head turner. But as priorities changed, I needed something larger, ended up with a Jeep Cherokee and the 280ZX just sat in the garage gathering dust. I decided to eBay it, the highest bidder didn't come through with the money but I did receive a call from a Ferrari dealer up in Canada. He said his client wanted the car, at any cost and asked me what I would let it go for. I just asked for what I paid for it and the very next day the money was in my account. A car transporter picked her up, that was a sad day, and she was shipped off to UAE of all places. A Datsun collector would then have her stripped right down and rebuilt as new." "Of course, now I am kicking myself for ever letting that car go,as I have learned there are very few low millage, 1 owner 280ZXTurbos around and everything else I have had since has never been as much fun or gained as much attention. It was a bit of a love hate relationship, I still don't love the styling." 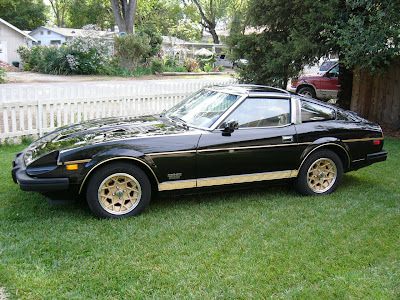 When introduced in 1979, the original 280ZX was a bit of a disappointment to many sports car enthusiasts. Datsun had changed the entire sports car landscape with the original Z car and it was going to be a tough act to follow. The 280ZX, with more refinement and creature comforts than the original Z, was seen as more of a GT car than a true sports car. In 1981 Datsun / Nissan changed all that by offering the ZX Turbo. At the time it was one of the fastest production cars sold in the US (Only a few "exotics", including the Porsche 911SC and 928, were faster). Richard mentions the styling in his e-mail. It was controversial. The 280ZX was, like many Japanese cars of its day, a bit "over-styled", but its shape was in line with many of the late seventies / early eighties wedge shaped sports cars and a shape that I still find appealing. These cars are becoming "keepers". A quick search of eBay and AutoTrader.com showed no listings for a 1981 280ZX Turbo similar to Richard's. A 280ZX Turbo was never a car I considered owning. After seeing Richard's pictures and doing the research for this post, that's changed. If that day ever comes where I wake up and find that my driveway size and bank account balance have mysteriously increased substantially overnight, a 280ZX Turbo would be on the (long) list of cars I'd go shopping for. Damn! Thats a sweet ride. If yer as old as me you probably remember the days when big Healeys, sunbeam tigers and cars like that could be bought for less then $1000. Try finding one for that kind of money now!!! The 280 Turbo is that kind of car. One day youll wake up and find them selling for $50,000. Buy one now if ya want one!!!! Haven't we all had cars we wished we hadn't sold! At least we got to own them for awhile.